Work from home - inner urban oasis. 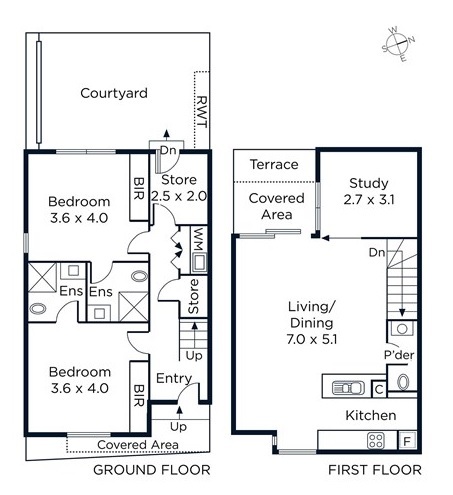 -	Large master bedroom, built-in-robes & ensuite. -	Sizable second bedroom, built-in-robes & ensuite. -	Expansive open plan living & dining. -	Separate powder room off living. -	Extensive natural light throughout. -	Private terrace, bifold doors. -	Gourmet kitchen, Miele appliances, integrated fridge, stone bench. -	Central laundry plus additional store room. -	Timber floorboards & superb architectural use of glass. Precision built, immaculately designed with a contemporary vision. An outstanding new home in Prahran's best neighbourhood. The prized corner location is between High Street's interior design mecca & gourmet cafes. Some of Melbourne's best fashion & homewares stores are in nearby Hawksburn Village. Close to all transport, parklands & the Melbourne CBD.